In what used to be an abandoned building with no windows and a solid inch of pigeon excrement caked to the floor, a grand piano now sits under spotlights. Folding chairs await an audience on brand-new hardwood floors at Chester's new live music venue, the André Café Acoustique at the corner of 5th Street and Edgmont Ave. The music venue is just one of several cultural venues that are springing to life in the Chester community. This struggling city is now home to an arts complex, a university art gallery, free jazz concerts and, this weekend, artists will perform in the Across Colors Cultural Festival. The emergence of a strong arts community is a sign of hope for Chester residents who have talent, and want to cultivate that talent - in music, the arts and theatre. André Café owner and jazz pianist Paul Fejko did most of the remodeling himself after 26 dump truck-loads of debris were removed from the space and the building's structure, which dates back to the 1840's was checked for soundness. The city approached Fejko in 2000 with the idea of saving the historic building and using it to develop an artistic community in Chester. Over the past couple of months, Fejko and Managing Director Donald Newton have staged several successful live performances, charging only $5 for a ticket - for now, while people are still getting used to the idea of live music in Chester. 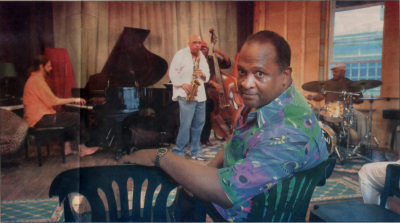 Don Newton runs the André Café Acoustique with Paul Fejko, left, piano with Marion Salaam - saxophone, Vernon Lewis - bass and Tony 'Stickman' Wyatt - drums. André Café Acoustique is a new venue for live music, ranging from jazz and gospel to 'holy hip hop'. Photo by Robert Gorecki - Delco Times Staff. "People are surprised," Newton said. "They say 'What? A Café? No. That ain't happening." "We do believe, once you get in here, hear the music, feel the space, it'll bring you back," Newton said. Live performances over the past several weeks were given by gospel vocalist Susan Coe; jazz trio Tony Wyatt, Adam Faulk and Vernon Lewis; Swedish fiddler Alicia Bjornsdotter Abrams; classical flute and guitar duo Veronica Mascaro and William Newman; bagpiper Rufus Harley; and mimes Laura and Micha Bertin. "The entertainment is quite diverse," Newton said. With seating for only 45 people, the setting is intimate enough to allow Newton to cater the events with his own home-cooked treats. Ticket prices do not cover the venue's expenses, and funding for the venture thus far has come from Fejko's back pocket. "I don't think anyone's in the arts for the money," Fejko said. Fejko is seeking funding for his non-profit organization, The Chester performing Arts Project, which was formed to promote and encourage the performing arts in Chester and bring life back into the community as a whole. "Part of what we're trying to do is to get people to feel safe out on the street," Fejko said. "I see the arts as a way to uplift, heal, motivate and raise consciousness in a community," Newton said. Dr. Lovell Harris was signing copies of his book, "The Mad Doc," half a block away at the Freeman Cultural Arts Complex. People were walking back and forth between the events. "There was activity on the street," Newton said. "That's what makes a town viable," Fejko said.